Maxi B-50 Complex™ is a dynamic combination of essential B vitamins! The “B’s” are essential in the breakdown of fats and protein, and maintaining gastric tract muscle tone. They also support the nervous system, skin, hair, eyes, mouth, and liver. Feast your eyes on this dazzling array of the vitamin B family in one easy to take capsule! Niacin (vitamin B3) (niacinamide) supports the conversion of calories from protein, fat, and carbohydrates into energy. It also helps the digestive system function and promotes a normal appetite, healthy skin, and nerves. Folate (as folic acid) helps support the normal formation of red blood cells and enhances the effectiveness of vitamin B12. PABA ((para-aminobenzoic acid) supports the utilization of pantothenic acid and acts as a coenzyme for protein metabolism. 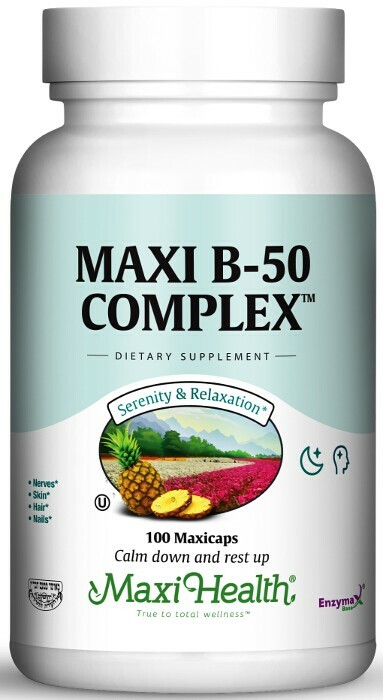 Bring the vitamin “B’s” into the your life with Maxi B 50 Complex™ from Maxi Health Research®. As a teacher and a mother I was finding it hard to find the energy to meet my responsibilities. My pharmacy recommended B-50 Complex. It did wonders for me! Within a short amount of time, I felt more energetic than I had in months. Thank you Maxi Health! I had a metallic taste in my mouth. I took Maxi B 50 Complex and it worked like magic. It even gave me more strength to clean for Passover. Not only that, I don't need to drink four cups of coffee a day anymore. I recommended it to my mother and husband.